My Acrylic paintings are in a list below with measurements. Title: Silhouettes - Dolphins and Stingrays are on stretched canvas, Each 12x36. The price for each Stingray/Dolphin silhouette is $30.00 plus $15.00 ea. for shipping. If you are interested, or have questions please email me. 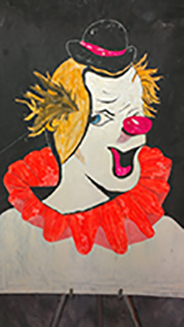 Title: The following clown acrylic is one of my first using this medium. I receive commission from purchases made within 24 hours after clicking the link buttons on this page.